Although he was a devoted and prolific outdoor painter, Russian landscape painter Ivan Shishkin was also a big fan of photography, according to an article in the Russian archives. He became closely involved with photos while working in Andrey Karelin's photography studio in 1870, coloring black and white photos for an album that was presented to emperor Alexander II. 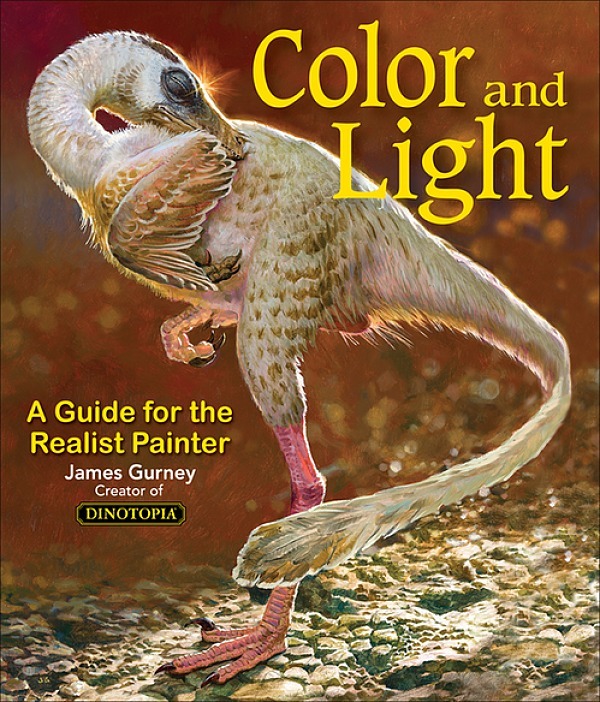 "... Let me give you one major piece of advice, that underlies all of my painting secrets and techniques, and that advice is — photography. It is a mediator between the artist and nature and one of the most strict mentors you'll ever have. And if you understand the intelligent way of using it, you'll learn much faster and improve your weak points. You'll learn how to paint clouds, water, trees — everything. You'll better understand atmospheric effects and linear perspective and so on..."
Shishkin enlarged details with a magnifying glass, and he also used a projector. When he came to teach at the Academy of Fine Arts in 1897, he specifically mentioned the need for a "magic lantern" type projection device to aid in student learning, not only for enlarging photos, but for presenting drawings at a larger scale. 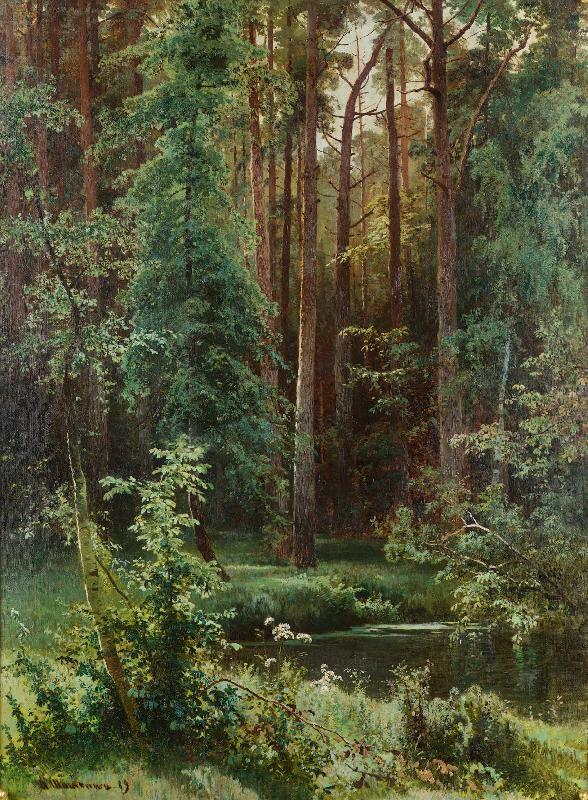 Although photographs were used widely by artists during his time, Shishkin was conscious of not mindlessly copying. He told his students that the way an artist uses a photo will reveal the artist with talent, because "a mediocre artist will slavishly copy all the unnecessary detail from photos, but a man with a flair will take only what he needs." But Shishkin never regarded photography as a substitute for painting outdoors from life. Kramskoi marveled at his productivity: "He paints two or three studies a day and completely finishes each of them." 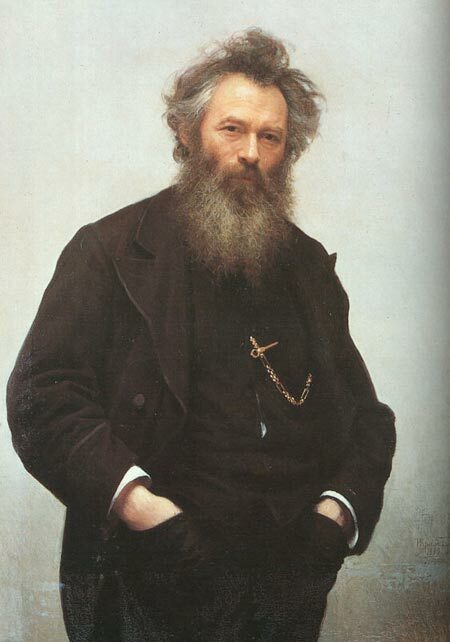 Shishkin wrote: "In the case of art - be it art, architecture, such practice is of the greatest importance. It alone allows the artist to appreciate the substance of the raw material which nature presents. Therefore, the study of nature is necessary for any artist, but especially for the landscape." Shishkin knew as much about individual plant forms as did the professional botanists of his day. He probably would have agreed with the critic Adrian Prakhov, who said, "I love the original character of every tree, every bush, and every blade of grass, and as a loving son who values ​​each wrinkle on the face of his mother." Shishkin said, "Work every day as if it is your daily duty. There's no need to wait for inspiration! Inspiration is the work itself!" Thanks to Samir Rakhmanov for the link and the help with translation. Great post on Shishkin, James. I am also working in gouache now and loving it more each time. As a seasoned watercolorist, the gouache is vivid and and user friendly. Love the DVD on Gouache in the Wild, well done. It really helped. I always "suspected" that Shishkin`s detail was not merely done by human observation (that is by no means a way to devalue his work). Your article is enligthening in the sense that it offers empirical evidence about his attitude towards photography. From a certain point onwards human visual capacity is simply restricted so i can picture him glanzing at the photo about the light effects and foliage-details in the painting in your text. Quite an open minded (non-dogmatic) fellow it seems. Kramskoi portrayed him with hands in his trouser pockets. May have something to do with Shishkin's character. Great post! Thank you for the information, I have always been hesitant to use photography but now I'm beginning to see that there are ways to use it intelligently and not as a crutch. The use of photography for reference is no different to me than Albrecht Durer using the Lucy. Always draw, that's what real artists do, but when you have a foreshortened figure feel free. Look at Remlrants central figure and the way the hand comes forward, also look at how Nelson Shanks used photo sparingly but effectively. Photography was new then. We are so surrounded by photos at all times, we can't really appreciate what a revelation it offered to these artists. Suddenly you could capture the detail, the moment, the values - and study it all at your own pace. In some cases it is very evident that photos had changed the way artists worked, for instance, you can compare the paintings of running horses before and after photography - suddenly the contrived "grayhound" pose used from time immemorial disappears, and true galloping pose replaces it. But the influence is everywhere, clear or subtle. Photography did do a great service to art, by letting the artists observe things in a different way. Of course, it also made a great disservice to it in other ways - permitting lazy hacks to copy, shrinking the demand for illustration, changing the public's perception of painting, etc. Also the comments of late. I watched Tim's Vermeer last night for the third time. I found it makes a good case for using visual aids like photography and the camera obscura, ludidograph (Lucy). In short it's tracing, the artist's dreaded crutch. In a jam as a commercial illustrator, it is efficient to get the work down fast and good. This helps, I use photo images, take them into photo shop, reduce to B&W, filter the image with outline, and apply all that into a grid in Illustrator. I usually do it for hands and faces to get a neede expression or likeness. I also attend figure drawing sessions weekly and find I am braver about leaving something in the drawing that "doesn't look right," it often is. Except the case for Vermeer using a camera obscura is extremely weak. The only reason I can see for it being so pervasive - besides marketing and sensationalism - is simple envy: taking Vermeer down a notch, so his genius can be explained away and not be a constant reminder of one's own mediocrity. You may have a post about this somewhere. 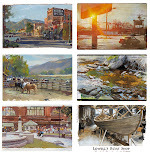 But I was wondering what kind of easel would you recommend for Plein Air painting? I'm trying to find something that is lightweight and easy to transport. Aly, here's a post with a lot of easel designs crowdsourced by GJ readers. At the end of that post is another link to my original post for a "lightweight sketch easel." For oil, I'd recommend the Open Box M pochade box, and there are several other models. Thank you for posting this. I am developing my own artistic style, and I adore the work of Ivan Shishkin. Astonishing artist. These posts about how he worked and his attitude about using photography are very useful to me.